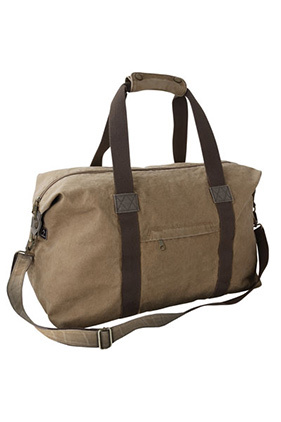 85% cotton/15% polyester, 12 ounce concrete canvas weekender bag. Removable adjustable canvas and webbing shoulder strap. Snap canvas wrap handles. Zippered main compartment. Expansion snaps for more capacity. Inside pocket. Exterior zippered pocket.